To the ordinary world, I will learn to survive.. When Shinji Mikami returned to Resident Evil with the fourth title in the main series, he didn't just develop the most popular entry in the franchise, he redefined the third person shooter. There isn't an over-the-shoulder action game out there since 2005 that wasn't in some way influenced by what he and his team had created. 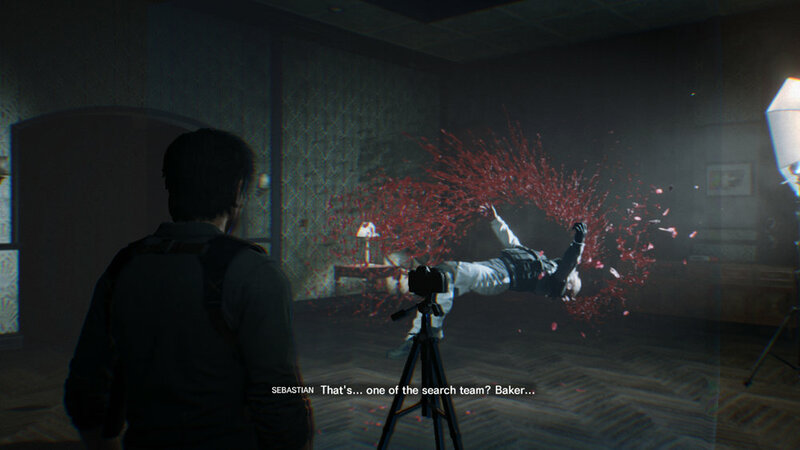 It wasn't long after that Mikami left Capcom and started production on The Evil Within, a survival horror game meant to make you feel powerless and outmatched against a bizarre assortment of creatures and various aspect of the horror genre. While he acts as a producer on the sequel, The Evil Within 2 feels far more polished and enjoyable than its debut entry and a solid game all around, apart from the fact it doesn't feel particularly that scary. 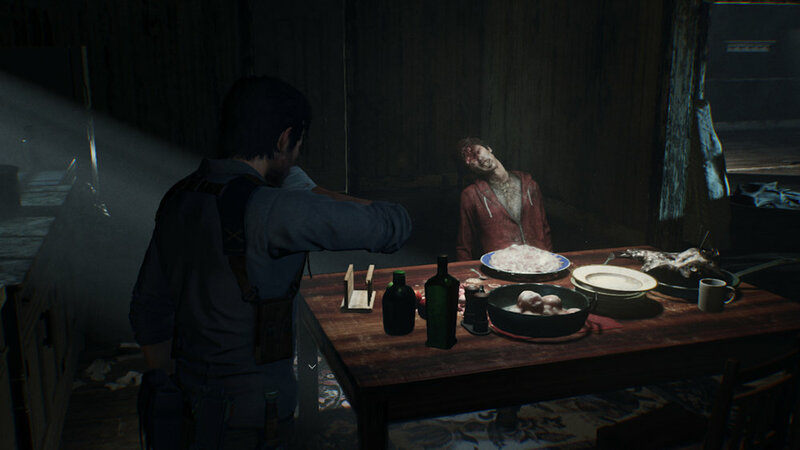 The Evil Within 2 takes place three years after the events of the prior game as series protagonist Sebastian Castellanos, while at a bar, drowning his sorrows over the disappearance of his wife and the loss of their child, Lily, is approached by his ex-partner, and Mobius agent, Juli Kidman. It's here that she confirms her involvement in covering up the death of Lily and informs Sebastion that she is, in fact, alive. Eventually, Sebastian is told that he can save her, that measures are in place to ensure the safe return of his daughter and he jumps at the chance to find her. This is where the story dives into cheap cable tv sci-fi with a bit of the matrix thrown in for good measure. Turns out that Lily was being used as a Core for a new STEM system to create a simulated town called Union. Mobius eventually lost contact with Lily as well as the team of agents they sent in after her. Sebastian, hooked up to STEM, is sent into this simulation and must make contact with the agents and together, track down and save Lily. The story itself wavers in quality, but the final few hours are where the bulk of the best moments occur. The game itself takes place in a solid chunk of the town as much of it is scattered into the sky as it is literally coming apart at the seams. The game consists of 17 chapters, but many of them are rather short and can be made longer by exploring the town, killing various creatures called The Lost, or discovering lore, items, and various digital echo's through a radio you'll always have with you. My play time with the game was around the 15-hour mark and given the various difficulty settings, you could easily get 20 hours out of the game should you track down each and every collectible, to say nothing of the new game plus mode that offers additional costumes and the ability to carry over most of your items. You'll meet a varied cast of characters that are actually fairly interesting and some of them will require you to do the odd favor for them as you all attempt to track down Lily. The story does fall into a few predictable moments with several characters dying exactly when you think they will, and even one twist with a central character ended up as an impressive bit of storytelling and beautifully executed. There is a little bit of filler midway through the game, but as I mentioned before, the final few chapters are some of the best content in the game. Without giving away the context, there is a scenario where you need to make your way through a wall of fire and it reminded me of the suicide mission in Mass Effect 2, one of my favorite moments in gaming. While I knew exactly how this moment would end, it was still one of the most enjoyable sections of the game. While the game isn't filled to the brim with a ton of boss encounters, there are a few here and they are quite enjoyable. You'll first meet up with Stephano, a crazed artistic killer with a camera who traps his victims in the very moment of their death, by his hands of course. These victims are in a constant state of reliving their death over and over again and it can be visually fun to see these horrific scenes. There's Father Theodore, a man who preys on the fact that Sebastian still has much fear and self-pity built up from failing to save his daughter, despite the fact he is aware she is currently alive. This causes Father Theodore to be a huge obstacle for Sebastian to contend with. While I won't detail anything about the final boss encounter, I will say that there are some fun and enjoyable mechanics to the fight and served as my favorite battle in the game. The Evil Within 2 takes place in Union, a simulated town built within a computer infrastructure meant to grant a peaceful experience for all those who reside in there. As is the case with all sci-fi stories where an individual is plugged into said simulation, you die in there, you die in real life, so unplugging those jacked in isn't an option. Union isn't a large sprawling location, but rather a few fair size environments that are split up and connected via the Marrow, special tunnels built to bridge the gap between sections of the town and offer up computer terminals that allow you to digitally teleport yourself to new locations. The town itself is extremely well designed with large open streets, back alleys and numerous ways to move around, which is fitting since you will often need to run or hide from various creatures. Each location has numerous aspects to the environment to deal out various types of kills as you'll find gasoline barrels ripe for explosions, flooded streets that will get put to good use with your electrified bolt-gun, or frozen canisters that can instantly chill a charging foe and have them shatter with a simple melee attack. You will also use the environment to duck into cover and this can be a toggle-based cover or holding down the button and then moving the analog stick to move around corners. Cover systems can be hit and miss and unfortunately, it's a miss here. I had several issues when moving out of cover and he would zip to the wall next to me, despite my not pressing the button to swap cover, and often it would lead to me being discovered. I rarely used cover unless I really needed to and while it's not the worst cover system I've seen, it is certainly not that great. The weapon selection is fairly limiting, but as Sebastian is working with what he can find on his own, it is somewhat fitting. You have handguns, shotguns, assault rifles, a sniper rifle, and a crossbow-like bolt gun that can fire off a wide range of different bolts. Each gun can be upgraded with weapon parts to allow for faster reloading, overall damage, ammo capacity, and fire rate. You can also use hand axes as well, but they are only good for one hit before they break. As you explore around Union you will collect a wide range of items like fuses, nails, metal pipes, plants, gunpowder, and more. This collection of junk can be fashioned into bullets, healing items, and the different styles of bolts. There are a few weapons that you will need to craft, but it's very minimal. Many of these items can be found by using your radio to detect beacons of dead Mobius soldiers, and if you are lucky, you may find satchels that increase how many of a certain item you can hold. The crafting system is fairly basic and the amount of items you find may vary on the difficulty setting you have selected, making every bullet count should you jump in on the harder settings. While you can upgrade your various weapons, you will collect green and red gel from your fallen foes to upgrade Sebastian himself. You can upgrade him in five key areas; Health, Recovery, Stealth, Combat, and Athleticism. This will allow Sebastian to take more hits, receive more health when healed, or make him a more effective killing machine, as you will need to kill as many enemies as you can to earn the amount of green gel needed to get the most out of this system. 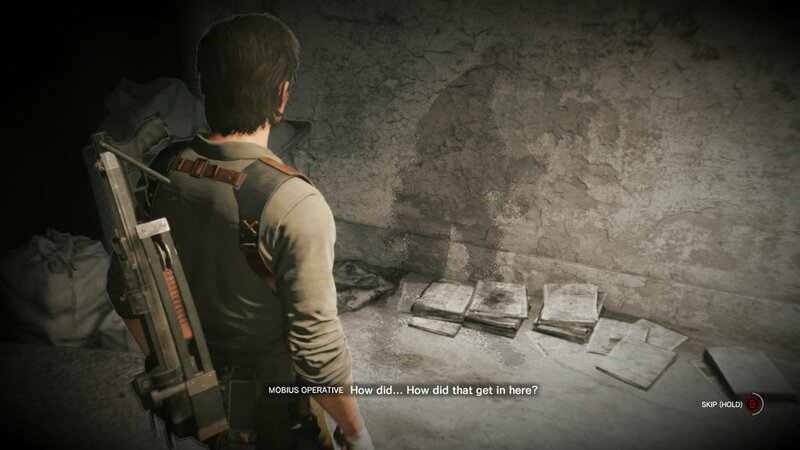 The Evil Within 2 isn't a visually impressive game, but it does succeed in creating an enjoyable atmosphere. The town itself is well designed and fits that small town feel quite well. The areas in Union where plants have overgrown around buildings and fences all look great, and the set-piece locations like the theatre and the church are some of the better-looking locations in the game. The creatures themselves are wonderfully designed and feature many things we have seen, and haven't seen, before. Whether it is four-armed creatures that walk on two sets of arms, with each side having its own sharp-fanged head, or a creature cobbled together with various body parts and multiple heads, Tango Gameworks have crafted some of the best creature designs I've ever seen. The Evil Within 2 suffers mostly from the same aspects that most creature-filled games do, and this was the case with Middle Earth: Shadow of War as well; its disappointing human character models. The people sadly all look incredibly plain and suffer from blurry facial features with no effort to detail. Even Sebastian himself doesn't look any better than any NPC does, with only the close-up shots of the character having any desirable amount of detail, and that is simply the in-engine model being used for a cutscene. The character models feel extremely dated and more in-line with what we saw at the start of the current generation of consoles. The voice acting can at times be as good as the dialogue, and that is to say, it is fairly painful, but in a cheesy and very cliche way. I can honestly say that not a single actor in this game brings anything impressive here and when most of the dialogue is "what the.." or "what in the hell? ", even Sebastian himself is no stranger to some really poorly written and spoken dialogue. That being said, the audio queues for the music, the creature sounds, and the cover of 'Ordinary World" all complement the game in their own unique way. At the start of the review, I mentioned that The Evil Within 2 isn't scary and that is probably the most unfortunate failing of the game. There are some moments of terror that visually look cool, like the early encounter of a mother force feeding her son to death, seeing a hallway of bodies next to an altar, or when you are stalked by a demonic woman who will instantly kill you should she catch you, but nothing in the game made me fearful for what was around the corner. The game attempts many times to create scares and there were moments where I could see what they were trying to do, but the game just fails at bringing the horror to survival horror. About the only glaring flaw that I haven't mentioned yet is Sebastian's walking and running, it is just awful. It feels like they motion captured an actor running on the spot, and not naturally forward. It's difficult to explain and something that really needs the visual aid to get the point across. It just doesn't feel like a natural running animation and I could never unsee it during my entire time with the game. Does it impact my experience with the title? not really, it's just a visual blemish on an overall great game. The narrative of Sebastian fighting the odds to get his daughter back is well told here and is backed up by some solid moments of action and horror, despite it never reaching the scare-factor I think they were shooting for. The crafting and upgrade systems are ok but feel very lightweight in the grand scheme of things. I enjoyed my time with The Evil Within 2 despite my few issues with it. It doesn't quite reach the highs of the best Mikami did with the Resident Evil series, but it's a nice step in the right direction, flaws and all. The evil within 2 WAS PURCHASED BY THE REVIEWER.